Learn how to play hockey. Tips. Reviews. For all you hockey fans, here we have a review of the Winnwell Pro480, an exclusive stick that can be purchased from Canadian Tire for $99.00. Winnwell markets this stick as the lightest stick available for under $100, as the stick only weighs--you guessed it, 480 grams. This stick was refreshed and improved, and is now known as the GX8. It has a 100% carbon graphite construction with a 12K graphite weave for extreme performance and durability. It's not for beginners, but for more experienced players. The shaft has a nice smooth matte finish that will allow you to move your glove freely up and down. I bought this stick and tested it out on the ice, and indeed it was nice and light and I was able to get shots off quite quickly. The one piece composite construction was quite sturdy and strong initially, but a few weeks into games I noticed the started to chip easily around the toe of the blade. I don't go around chopping sticks or banging blades on the ice, so maybe others were playing D on me pretty hard. But aside from that, the stick still held up all season long and I was able to score some pretty nice goals! The sub-$100 stick market is a very competitive one. We see so many sticks priced at $99 or less, or for $20-30 more. The Winnwell Pro480 is by far one of the best 'bangs for your buck' if you're looking for a durable one piece composite stick. At 480 grams, it very light and will enable you to 'dangle' with the puck and get off those one timers a bit faster than heavier sticks. I enjoyed this stick and it definitely made an impact on my game. Let me know if you've ever used the Pro480! Learn more by checking out Winnwell's website. So a while back I wrote about how I signed up for power skating lessons at UBC. Here is my recap of the lessons, and my thoughts. At the end of most lessons, we'd finish off with 5 on 5 scrimmage hitting the 'posts' for 15 minutes or so. So Are The Power Skating Lessons Worth It? Yes. If you're a newbie skater, or a veteran that wants to shake those bad habits, these lessons are essential to improving your game. Sure, we all can skate but what about learning how to do it properly? I've already utilized what I've learned from these lessons and applied them to my game in both league and pick up play. We all wished our parents signed us up for ice hockey when we were younger but the fact is that's not possible for everyone. So to learn the fundamentals from our seasoned coaches Amy and Bradley (both were great btw), it was a blast. No matter how many lessons we take, the only way we can improve is to practice, practice, and practice some more. I found backwards crossovers the most difficult, and I'm still trying to master power stopping on both sides. My tip for you beginners out there? Bend your knees and stay low. Where did you learn how to skate? Who's Going to Win the 2010-2011 Stanley Cup? You know what's the best part about Spring? Yes, that's right--the NHL playoffs. The Vancouver Canucks are leading the league in points. It's a tight race out West for the final four spots, with multiple teams separated by 2-3 points or less. It's going to come down to the wire. Will Vancouver make it all the way? I don't know. But what I do know is that this year's team is playing with such amazing team chemistry, it looks like their odds are good to go deep. What's your favourite team? Who do you think can go all the way? If you're just starting out ice hockey, you're going to need equipement. Depending on your budget, there are a tonne of ways to buy equipment. You can find used stuff on Craigslist or Kijiji, but personally I don't want to use sweat-stained stuff from other people. It's gross, and can be filled with harmful bacteria. Yes, it did all add up but investing in decent equipment that will last years will pay off. I got my hockey bag from Costco, and it was one of those new ones that can roll. Hey, there's no need to suffer by carrying heavy equipment! Where did you buy your ice hockey gear? What is the Best Hockey Stick for New Players? Finding a hockey stick can be easy. Just visit any sports store, and get one within your price range. If only it could be that easy! There are just way too many choices out there. Nike, Bauer, Easton...the list goes on. It can be overwhelming. What's the best way to find a stick for new players? Get out there and try sticks. I've played hockey lots before, but the game is a bit different when you're on ice and playing with a puck. Some stores that carry a large selection of sticks are the chain stores, like SportChek or Canadian Tire. Be sure to support some of your local hockey stores as you can find some real gems there too. So, the question I'm out to ask you is: what is the best stick you can get for under $100, that is lightweight, durable, and looks good? We're trying to find out, and when we do, we'll get back to you with a full review. 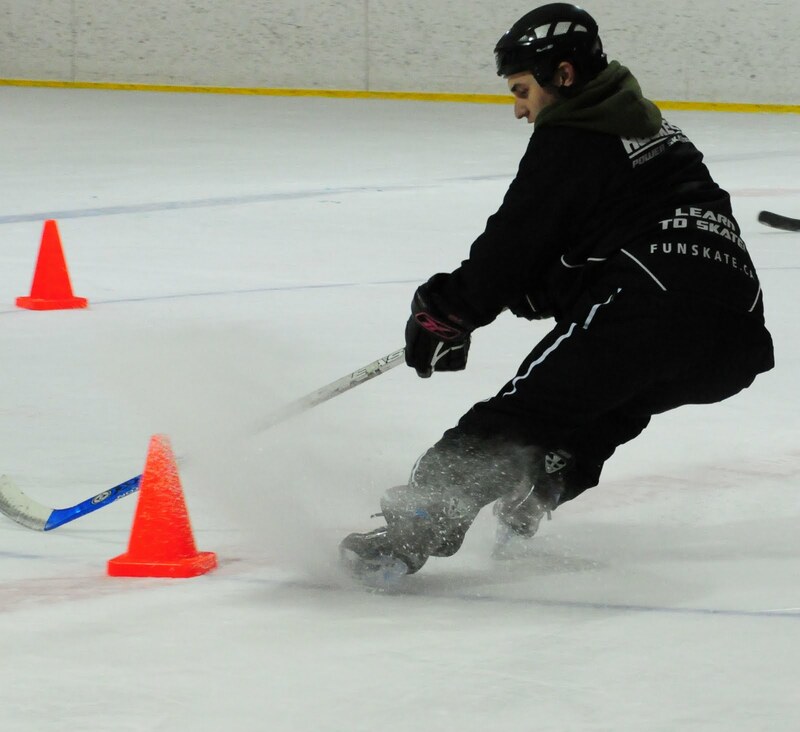 This program is designed for players with minimal hockey experience. There is a strong emphasis on skating technique including: cross-overs, stopping, pivoting and backward skating. Sessions will also focus on the fundamentals of puck control, passing and shooting. Prerequisites: Must be able to skate forwards. I will document each lesson in detail, and pass on any tips that I come across. Stay tuned. We've all played hockey out in the streets when we were kids. Ball hockey and rollerhockey dominated my time outside. However, I never did get the chance to play "real hockey", aka ice hockey. Get ready to follow my journey as I take you from the streets to the ice. Expect tips, tribulations, product reviews, and more. Welcome to My Hockey Journey.